Scapy is able to forge and decode packets of several protocols, send and capture them, match requests and replies, and much more. It can be used to handle most network tasks such as scanning, tracerouting, probing, attacks, network discovery, to name a few. The basic unit in a network communication is the packet. So let's create one! Scapy builds packets by the layers and then by the fields in each layer. Each layer is nested inside the parent layer, represented by the < and > brackets. Now that we have a (very simple) packet, we can send it over the wire. Scapy also has the ability to listen for responses to packets it sends (for example, ICMP ping requests). As in the send method, Scapy has two types of packet sending & receiving, based on the network layer. In the layer 3, the methods are sr and sr1. The former returns the answered and unanswered packets, while the last only returns answered and sent packets. In the layer 2, the methods are srp and srp1. The former returns the answered and unanswered packets, while the last only returns answered and sent packets. A good way to remember their differences is to keep in mind that functions with a 1 are designed to send the specified packet and end after receiving 1 answer/response (instead of continuing to listen for answers/responses). Sent 3 packets, received 3 packets. 100.0% hits. Scapy allows you to craft SYN request and match the corresponding returned SYN/ACK segment. However, running the snippet above will not work. The reason is that crafting TCP sessions with Scapy circumvents the native TCP/IP stack. Since the host is unaware that Scapy is sending packets, the native host would receive an unsolicited SYN/ACK that is not associated with any known open session/socket. This would result in the host reseting the connection when receiving the SYN/ACK. This does not prevent the source host from generating a reset each time it receives a packet from the session, however it does block it from silencing the resets. Now that we know the Scapy basics, let's learn how to perform a port scanning. Finally, to return to the original configuration, we use conf.route.resync(). a = Ether()/IP(dst="www.google.com")/TCP()/"GET /index.html HTTP/1.1"
0000   00 90 A9 A3 F1 46 A4 17  31 E9 B3 27 08 00 45 00   .....F..1..'..E.
0020   E1 10 00 14 00 50 00 00  00 00 00 00 00 00 50 02   .....P........P.
Scapy's fuzz() method allows one to craft fuzzing templates (by changing default values by random ones) and send them in a loop. Scapy has also commands for network-based attack such as arpcachepoison and srpflood. Additionally, we can use Scapy to re-create a packet that has been sniffed or received. The method command() returns a string of the commands necessary for this task. If you have GnuPlot installed, you can use the plot functionality with Scapy. It's pretty neat. We also can plot graphs with the function plot() and graph(), and we can generate 3D plots with trace3D(). The idea of this script is to build a sniffer to capture SMTP, POP3, and IMAP credentials. Once we couple this sniffer with some MITM attack (such as **ARP poisoning), we can steal credentials from other machines in the network. Running this script when loading load some mail client (such as Thunderbird) will allow us to see the login information, if they are sent to the server as plain text. I talked about ARP cache poisoning using command line arpspoof in my guide about Wireshark. Here we are going to see how to implement similar tool using Scapy. ARP cache poisoning works by convincing a target machine that we are the gateway, and then convincing the gateway that all traffic should pass through our machine. Every machine in a network maintains an ARP cache that stores the recent MAC addresses that match to IP addresses on the local network. All we need to do is to poison this cache with controlled entries. The best way to test this is using a Windows virtual machine (take a look in this guide I wrote). Define constant values, set our interface card, and turn off output. Resolve the gateway and target MAC address. The function get_mac use the srp method to emit an ARP request to an IP address to resolve the MAC address. Start the poison thread to perform the ARP poisoning attack. This will start the sniffer that captures the packets. The function poison_target builds ARP requests for poisoning both the target IP and the gateway (in a loop). Write out the captured packets and restore the network. The function restore_target sends out the ARP packets to the network broadcast address to reset the ARP caches of the gateway and target machines. print "[-] Failed to get gateway MAC. Exiting." print "[-] Failed to get target MAC. Exiting." [*] ARP poison attack finished. 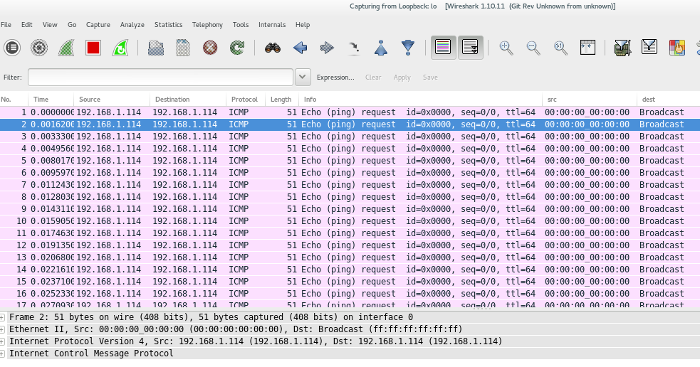 Now open in Wireshark the PCAP file resulting from the script. BAM! The entire traffic from the victim is in your hand! We have learned how to steal credentials from some email protocols, now let us extend this to all the traffic in the network! To try to detect images that contain human faces, first either create or download some PCAP files with these images. Some dump sources: here, here, here, and here. 1) The function http_assembler takes a PCAP and separates each TCP session in a dictionary. Then it loops in these section using the HTTP filter (which is the same as Follow the TCP stream in Wireshark). After the HTTP data is assembled, it parses the headers with the get_http_headers function and send to the extract_image function. If the image header are returned, it saves the image and try to detect faces with the function face_detect. The extract_image function determine whether an image is in a HTTP response by checking by the 'Content-Type' string. Finally, the face_detect function uses the opencv library to apply a classifier that is trained for detecting faces. It returns a rectangle coordinates to where the face is and saves the final image. Several types of image classifiers can be found here. Wifitap: PoC for communication over WiFi networks using traffic injection.